In actual fact, the t-shirt reads…”Eat, PAY, Leave”! And it wasn’t easy leaving! There is a phenomenon that happens when you go to Bali ~ it can pull you in like quick sand ~ and you’re unable to leave the enchanting Bali! And that is why the poor dear island is in peril today ~ it is being loved to death! But a little bit about that later. The experience of living in Bali for 5 months is just so far out of my “range” and so much happened in those 5 months, that sitting down to keyboard with you is like locking eyes with an alien ~ how do I explain the world we have been living in and what living in it has done to/with/for us? I know. Let’s start with Eat, Pray, Leave. There is a mini-bus with Eat, PAY, Leave written on it. You don’t actually SEE what it says for the longest time, because you automatically “see” Eat, Pray, Love – right? Well, I don’t know if that little book, and the subsequent movie with Julia Roberts, did the same thing for tourism in Italy as it did in Bali, but those who have been here for years ~ and there are many ~ say it has “ruined the place”. I beg to differ, but I’m new and know nothing of the way it was before “the movie”. 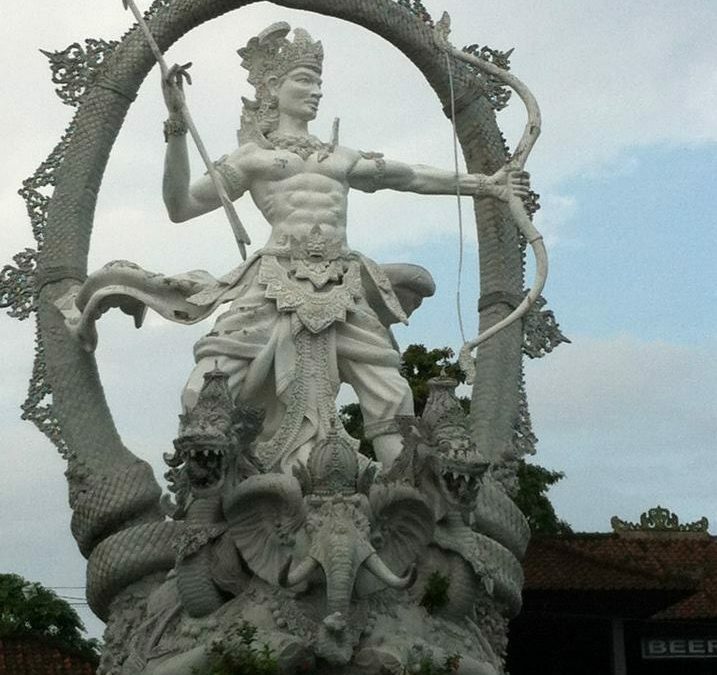 What definitely hasn’t changed about Bali is the “magic” of the island. It is legendary. We heard about it this way ~ “Bali either loves you or spits you out. You either stay there “indefinitely” until you never leave, till its too late to go, OR you are given some kind of sign to ‘Get outa Bali now!’ and you simply find your body on the next possible flight out. Our experience was that Bali has enveloped us; wrapped us in her arms, rocked and lulled us into forgetting what day it was, what month it was, and seduced us into thinking that perhaps we should live the rest of our lives there! 1) Just like India, this island is Hindu (the rest of Indonesia is predominantly Muslim or Christian) and “ritual” or “aarti” is done not only daily but seemingly hourly ~ it is a VERY big deal there ~ far more so than in India, it seems! But in India there are offerings in front of every door as well, it just seems like Bali’s devotion is so much more…flamboyant, yet that isn’t the best word to describe it either! It is truly difficult to wrap words around. It is common-place to see women with trays of offerings, waving incense sticks in every corner of every property; whether that is their home or the shop/restaurant or hotel they work at, at any time of the day. In fact, after a while, you just don’t even “see” that anymore! So the “vibe” there is very high! Very Shakti! 2) Bali is not only surrounded by water but it is saturated ~ it rains every day! ~ the humidity is crazy! What’s the point? Well, one Balinese man told us that since everything travels ON water on this planet ~ everything! ~ and because of the dense moisture there, the air of Bali is a conduit for, well, everything! Good, evil, love, hate ~ you name it, and it is flowing through the air there BIG time! ON the air! And the Balinese always acknowledge the “dark” side…often very creatively, especially in their Ogo-ogos that they create for Nippy, their New Year’s Day (Google that and see what shows up! )…but the upshot of all this is that manifestation time there is radically shortened ~ THINK it and it happens! Seriously. We came to FULLY realize just HOW powerful our thoughts are because of the evidence of it that we saw on Bali ~ it is definitely one unique spot on this planet. So what hasn’t changed is the magic; really good news. What HAS shifted there? Well, the cost of everything has doubled ~ this is the biggest complaint ~ along with the tourist traffic. This has been the “Hawaii” of Australia ~ often where Aussies have taken their retirement dollars to stretch them out for the remainder of their lives ~ and now the whole WORLD is in on it! AND willing to pay BIG BUCKS to be there ~ shifting economy for not only the Balinese but for the Aussies too! Many a miffed Aussie over this shift! And every tourist gimmick imaginable is running. But for whatever reason, it just doesn’t seem to have spoiled the ambiance. With no previous knowledge on how it WAS, I am no expert on how it has changed, but it is STILL a magically mystical place to be. Maybe it was far more potent before? Don’t know, but I had never felt LIFE, so vibrantly alive, as I began to while we were living on Bali. And the good news is that the feeling hasn’t diminished one little bit! Can I say how much of this is Bali, and how much of this is what happened to/for/with us in India! Nope, cause we went to Bali after the Oneness University/India, and it seems like Life will be forever different than before! Thank You, God! Wahe Guru! One of the things that IS like India but uniquely Balinese is the TRAFFIC! OH MY GOD, you have never LIVED until you have been THRILLED by a GIANT ~ GIIIIANNNT! ~ tourist BUS flyyyyying along a MAAAAJOR STREET ~ only slightly wider than a Vancouver ALLEY! ~ VERY fast! Hair-RAISING! And HOW do they find the CONFIDENCE to go at that SPEED?!! When there’s another bus coming from the OPPOSITE direction??! Holy crap! And your VIEW of this is from a seat in a warung (restaurant) that is RIGHT BESIDE the street ~ only sometimes is there a sliver of a sidewalk separating you ~ with uncountable motorcycles zipping around these lumbering giants! It just leaves your mouth dry, eyes wide shut, squinting through slits, every sense ON and FREAKING. And RARELY an accident. People do not drive like that in North America without drugs and they don’t do nearly so well, as we know. In fact, it is a MUST to drive in an “altered state” in Bali ~ but of a different kind, of course. Because if you drive your motorcycle with your HEAD you are a definite HAZARD. ALL driving is done on an intuitive level ~ total Third-Eye driving ~ cause if you THINK, you crash. They WEAVE along the road ~ it is an energetic dance; metal and flesh as one. Unlike India, there is not so much animal traffic. Just dogs. And chickens. Chicken jokes must have started in Bali, cause you often wonder “WHY did that chicken cross the road?! !” But in this case, the chicken often changes its mind and crosses back when half way and then panics and thinks better of it and comes back the other way and when a motorcycle finally gets past the chicken there is usually a passenger on the back of the bike looking back at that chicken in comical confusion, wondering WHY and whatever that chicken was doing it was NOT crossing the road!!! And then there are the dogs. The dog’s life on Bali is hard and heartbreaking to see ~ starving, skinny, scabby-ridden, homeless, “owner”-less”, family-less dogs everywhere. They tell the story of how a few years back they rounded up all the dogs and euthanized them because there were just so many of them and they were forming dangerous packs and chasing the motorcyclists at night, then in broad daylight. Can you imagine? Dogs doing “it” at the side of the road are as common-place as our recycling bins. So odd to see male dogs with “balls” – Canadian dogs just don’t have that package dangling at the back any more, and you don’t think about it until you SEE it on these dogs and think “Hey, whose livin’? The Bali dog or our version?” But how, and for how long? And that is how RICH life is here – life in your FACE with BIG questions and curious answers to really think about. But despite all of the fascinating aspects of Life to ponder on Bali, the day finally came when the spell lifted just enough to remember we have friends and community that we dearly love, and we were really missing them. So it was time to give up our seat at the side of the road watching the dogs and the chickens and the wheels going round and round. And here we are. And almost 3 months of reintegration have flown by! Wow! How did that happen? Did we really leave Bali?!! But eight months on the road shifts everything and we have been redefining our life here in Vancouver, slowly making our choices on how we want to proceed and re-create our lives. We started by spending five weeks with dear friends, and we discussed it all ~ pulled it apart and put it back together again ~ what a delight! Then it was time for a deep cleanse. Hehehe. Picked up a few buggly wugglies on our travels ~ probably had a few when we left if the truth is told ~ and we have finished a 29-day Master Cleanse and are just eating food for 4 days now. We all scoured our innards too…started with a NAP Parasite Cleanse kit and a daily regime of enemas, salt flushes, colonics, Chi Quong, hot tub, solar appreciation (wow, what a summer!!!) and generally letting it all GO!!! And felt the freedom from food that is hard-won but comes as you keep with it and gradually nail that reset button! And yet, armed with knowledge, it does not stop the mind from thinking it would be a good idea to have “a little something sweet” after a meal. But knowing better and not eating for ages and all that and a rebounder too, STILL doesn’t prepare you for the mind’s little suggestions. We gasped at the audacity of it! How COULD it try to sneak that in so soon? Silly mind. Caught! And that’s the real work. The mind and all its little games are what we’re actually sussing out! That is the work we did at Oneness and it sure is coming in handy! That is the work done with alcohol and the 12 Steps and that sure is coming in handy! Cause this is simply another stage in a Shift of a LIFETIME we have undertaken and we are not letting all this beautiful preparation go to waste! And so, we are ready to ROCK! Ready for workshops, talks, sessions. Ready to start that book! Ready to rewrite all the stuff we’ve learned more about where the old manual leaves off, as far as we’re concerned. Ready to do all this and more – in fact, we even have a place to live now! We have rented the Master Bedroom Suite in a huge house in Shaunnessy in a community home that we are SUPER PUMPED about joining minds and communities with…. ….as soon as we get back from Europe. Just one more piece and we’re done. And it is perfect, of course. Missing my only child since she left for France; she told me less than two weeks ago that she has the last week of August off and could I come to visit? So who would have thought that I’d get not one but TWO seats to Europe in August using air miles? So taking what was available, we are heading to London August 18th to visit my brother and nephew, then going to Paris August 25th to see Sadie, returning to London September 2 to visit with Paul’s family and to spread his mother and father’s ashes where they requested – over the river they walked along when they were courting all those years ago, before moving to Canada. And of course, it is SO perfect. This completes our journey in every way and we return home fully prepared to be here in every way for ourselves and for our community. How does it get any better than that?! So that’s our story. That’s what we’ve been doing for one of the most amazing years of our lives. And it feels truly magical ~ there is definitely a vibration in the air, a resonance of reverence for the perfection of Life. And yes, we are going to facilitate Oneness Awakenings and Quantum Touch Level I & II as well as Quantum Touch’s newest workshop ~ Self-Created Health. And yes, we are going to bring back the Cacao Journey! And yes, we are going to start cleansing support groups ~ it truly is the secret code to success!! And yes, we believe 2014 will see the return of the Living Vision retreat that started so much in this community. So please, let us know what you have been doing while we have been away and let us know how we can be of service in your life and community. May You Be Blessed Beyond Your Wildest Imaginings!